Use the water + and - feature on the Solar Sync module to adjust the percentages applied to the controller. The Solar Sync comes from the factory set at 5 and can be adjusted from 1-10 with 10 giving you a higher percentage and 1 giving a lower percentage adjustment. Seasonal Adjust too low: Increase the value on the Water Adjustment scale (10 is max). Once the setting is changed, the controller will immediately be updated with the new Seasonal Adjust %. Increase the Water Adjustment setting until the desired Seasonal Adjust % is shown. If you max out the Water Adjustment scale at 10 and still require more Seasonal Adjust, move down to the next lower Region (from Region 4 to 3, for example). Seasonal Adjust too high: Decrease the value on the Water Adjustment scale (default setting is 5). Once the setting is changed, the controller will immediately be updated with the new Seasonal Adjust %. Decrease the Water Adjustment setting until the desired Seasonal Adjust % is shown. If you minimize the Water Adjustment scale down to 1 and still require a reduction in Seasonal Adjust, move up the next Region (from Region 2 to 3, for example). Solar Sync is a sensor system that, when connected to a Hunter controller, will automatically adjust your controller watering based upon changes in local climate conditions. The Solar-Sync utilizes a solar and temperature sensor to measure on-site weather conditions used to determine evapotranspiration (ET), or the rate at which plants and turf use water. 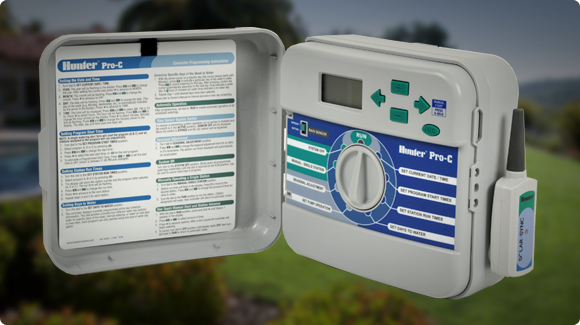 In addition, the Solar-Sync sensor includes a Hunter Rain-Clik and Freeze-Clik sensor that will shut down your irrigation system when it rains and/or during freezing conditions. A small module connects the sensor to the controller and will automatically increase or decrease watering run times based on changes in weather.